I am still in denial that baby girl is going to be here next week! I am so looking forward to not being pregnant ever again! Reality is starting to set in, however, because I haven’t been getting much sleep lately. The lack of sleep for the first few months is something that I am not looking forward to. I am fortunate to be off from school for the summer, but still I do have a three year old that still needs taking care of in addition to my newborn. I am going to be sleep deprived! I remember the sleep deprivation with TJ. Trying to remember when the last time I fed him or changed his diaper became a chore, especially if I forgot to write it down. I knew there had to be a better way. I first saw the ITZBEEN baby care timer in a store when TJ was about a year old and thought to myself that if I ever was pregnant again, this would be the first thing I would buy. So… what is a pocket nanny? The ITZBEEN Baby Care Timer is a multi-purpose tool that helps you remember the basic details of baby care. 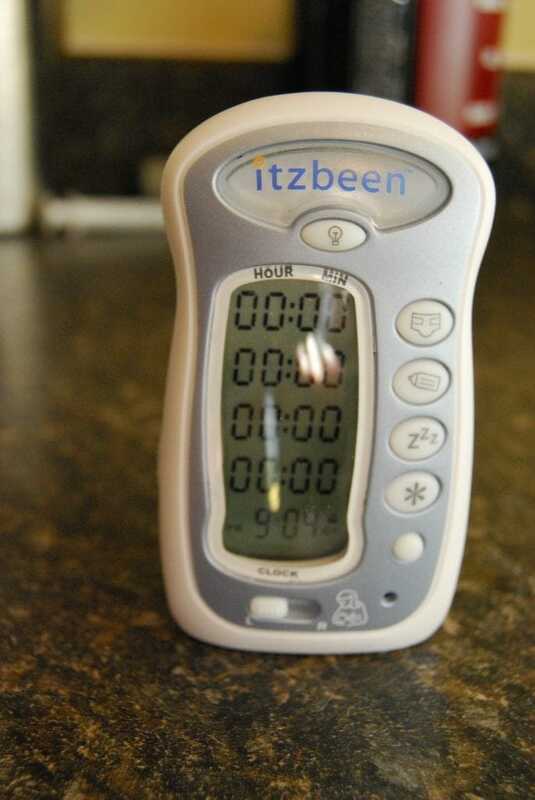 ITZBEEN has four timers that count up with the touch of a button…so you will always know how long it’s been since the last diaper change or feeding or nap! You can even program the last timer for whatever you need, medication maybe. If you are a breastfeeding mom, there is even a little reminder switch letting you now what side your newborn nursed on during the last feeding. I haven’t had to use the timers yet, but I can tell you that the nightlight feature and the clock on the ITZBEEN have been a lifesaver over the past month. I often check it when I get up in the middle of the night for those frequent bathroom breaks that pregnant women have. I don’t want to wake up the hubby, so I just take my ITZBEEN with me to the restroom to find out what time it is. If it is already so helpful before the baby comes, just think at how helpful it is going to be afterwards. 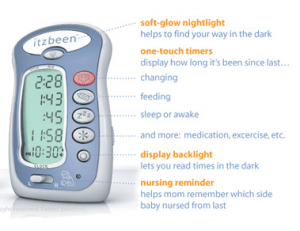 The suggested retail price of the ITZBEEN Pocket Nanny is $24.99 and can be purchased at stores nationwide and at their website. It has been awarded a 2007 Juvenile Products Manufacturing Associations Innovation Award, and a 2007 iParenting Media Award for Best Baby Care Product. One (1) lucky reader will win an ITZBEEN Pocket Nanny in their choice of color (blue, pink or green). This giveaway will end at midnight on May 14. Open to US residents only. Good Luck! A huge thank you to ITZBEEN who provided the product featured in this post. This review is my honest opinion and is not influenced by any other source. I love the timer alarms. Convenience-i would love how it does the thinking for me! I love that it has a switch to remind you left or right side when you breastfeed. I love the ability to keep track of feedings with this!! Breastfeeding a newborn is exhausting and I am constantly trying to remember when we started our last feeding. This would be a lifesaver! I love the fact you can even tell what side you have nursed on with baby. Thats the one thing I always forget. My favorite feature is that it records everything at a touch of a button. No longer do I have to look at a clock and figure out what time it is and how long its been since the last whatever. Love the breast feeding reminders. Could’ve used that with my baby. I love that it helps keep track of everything at a time when your brain is so fried! Especially the breastfeeding tools! I like that it’s also a soft-glow nightlight. I like that I can also set reminder alarms for each of the four timers!